Nomadgal jewelry is a collaboration between the Tuareg nomads of the Sahara and artist Leslie Clark. The Tuareg are known as the blue men of the desert because the indigo dye of their turbans rubs off on their skin, turning them blue. They dominate the Sahara and have for centuries because of their skill with the camel. Each noble Tuareg family associates with an artisan family. The men make jewelry and the women, leather work. Nomads carry all their goods with them when they move camp in search of pasture for their herds. They use their art forms in their daily lives. Ornate leather bags are suitcases. Silver daggers are pocket knives and swords are weapons. Jewelry tells where you are from. The Tuareg work without electricity using bellows, forge and hand tools. They use traditional designs and create new ones using traditional motifs. Each jeweler signs his work in Tifinagh. The written alphabet of the Tuareg, Tifinagh, is one of only two written languages ever developed on the continent of Africa. Artist Leslie Clark designs and assembles the necklaces from the exotic elements she collects on her travels around the world. 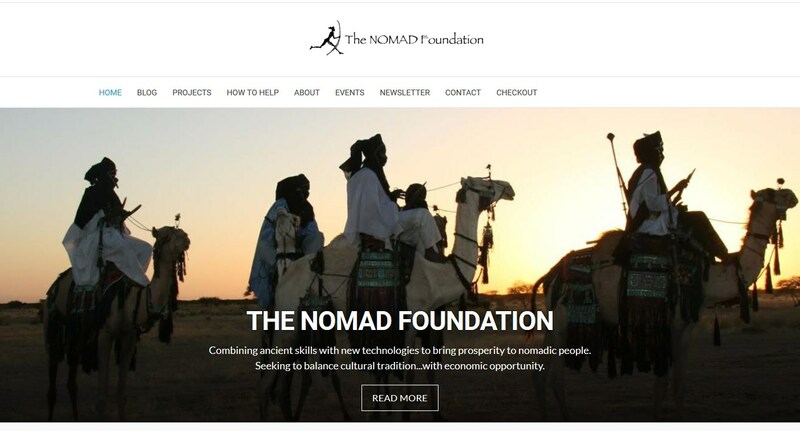 She donates proceeds to the Nomad Foundation projects which help nomadic populations prosper while preserving their traditions.